New Depression Drugs Offer Hope For Toughest Cases : Shots - Health News The anesthetic and club drug ketamine seems to quickly lift depression symptoms. How does it work? Researchers are searching for the answer in an attempt to make a new class of depression medications. 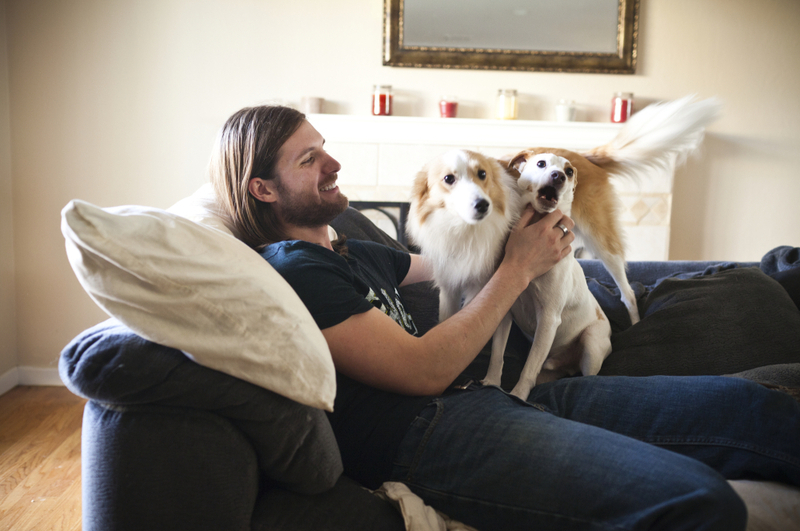 Chris Stephens, 28, who has been battling depression all of his life, plays with his dogs at home in Concord, Calif., on Friday. After a dose of ketamine, Stephens says, "I actually wanted to do things. I wanted to live life." A club drug called "Special K" is generating a lot of buzz among researchers who study depression. That's because "Special K," which is actually an FDA-approved anesthetic named ketamine, can relieve even suicidal depression in a matter of hours. And it works on many patients who haven't responded to current antidepressants like Prozac. Those traditional drugs, which act on the brain's serotonin system, can take more than a month to kick in, and don't work for up to 40 percent of people with major depression. "We can take care of a migraine in hours," says Carlos Zarate, a brain researcher at the National Institute of Mental Health who is studying ketamine. "So why do we have to wait weeks or months with depression?" Ketamine itself isn't likely to become the next big drug for depression because it has troubling side effects, including hallucinations, Zarate says. But understanding how ketamine works could lead to safer drugs that are just as effective, he says. Ketamine was developed in the 1960s as an anesthetic and pain reliever. In the 1970s, recreational drug users figured out that if you take enough ketamine, you can have a mind-bending experience. Monday afternoon I felt like a completely different person. I woke up Tuesday morning and I said, 'Wow, there's stuff I want to do today.' And I woke up Wednesday morning and Thursday morning and I actually wanted to do things. I wanted to live life. But the drug's ability to relieve depression wasn't clear until just a few years ago. And since then, most of the people who have received ketamine for depression have been participants in scientific studies of the drug. 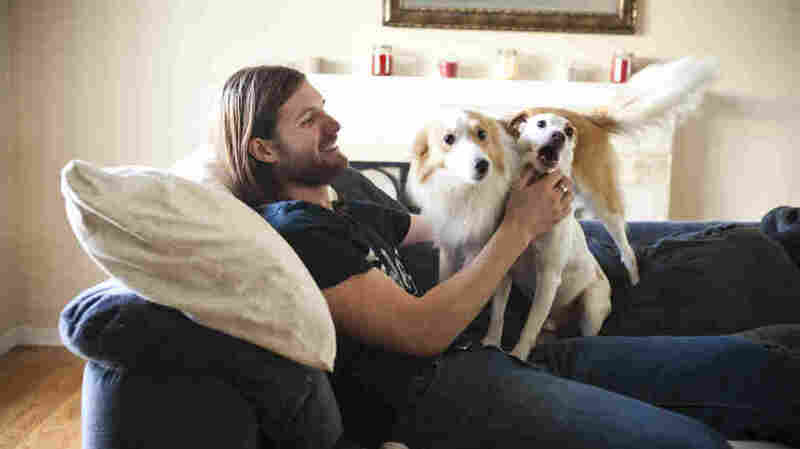 One of those people is Christopher Stephens, 28, who lives in the San Francisco Bay Area and was diagnosed with depression when he was just 15. "My first prescription was for Paxil," he says. "Then I started on Prozac, and then, you know, at 19, that's when I decided that I had to go and try new medications." It's hard to remember all of those medications, Stephens says. Then he reels off a list that includes Klonopin, Ativan, Valium, Xanax, Remeron, Gabapentin, Buspar and Depakote. Some of these drugs didn't work, Stephens says. Others caused nausea, headaches and insomnia, as well as sexual side effects. And despite all the drugs, Stephens' depression kept getting worse. Ultimately, he just couldn't function. He lost his job as a special education assistant. Even his greatest joy, teaching martial arts, wasn't enough to keep him going, he says. "I went on the Internet and I started researching ways to end your life," he says. "A lot of people think, 'Oh, I can down a bottle of Tylenol and that'll do it.' What that'll actually do is kill your liver and you slowly die, which is not a good way to go. I wanted to research the most efficient and painless way to do it." PART 2: Could A Club Drug Offer 'Almost Immediate' Relief From Depression? But Stephens wanted to do something good before he died, something that might help other people avoid the hopelessness he was feeling. So he called up the University of California, San Francisco, and offered himself up as a sort of human lab animal. He thought maybe scientists could learn something about depression by studying his brain. The call to UCSF got Stephens referred to Zarate, a researcher who thinks current depression drugs are on the wrong track. Zarate sees depression as a bit like a leaky faucet in the brain. There are different ways to stop the leak, he says. "You can go straight to the faucet and you can fix it," he says. "Or you can go to the water plant and shut down the water plant. The end result will be the same." We can take care of a migraine in hours. So why do we have to wait weeks or months with depression? The current antidepressants act in a way that is like shutting down the water plant, Zarate says. It takes a long time for the water to stop flowing through the miles of pipes that eventually lead to the leaky faucet. He thinks the reason is that these drugs act primarily on the brain chemicals serotonin, norepinephrine and dopamine. Ketamine acts on a chemical called glutamate, which is much closer to the problem, Zarate says. So Zarate was intrigued in the early 2000s when he began to hear anecdotal reports that ketamine could relieve depression almost instantly. But as a scientist, he says, he was concerned that these dramatic reports might be too good to be true. So he and other researchers decided to conduct a scientific study. It involved 17 patients with depression — people who, like Christopher Stephens, had tried lots of medications without success. After a single dose of ketamine, though, 12 of the 17 got much better within hours. And the effect lasted for more than a week. The result, published in 2006, got international attention. And since then, Zarate has given ketamine to many more patients, including Stephens. Stephens himself has vivid memories of the day he got ketamine. It was a Monday morning and he woke up feeling really bad, he says. His mood was still dark when doctors put in an IV and delivered the drug. "Monday afternoon I felt like a completely different person," he says. "I woke up Tuesday morning and I said, 'Wow, there's stuff I want to do today.' And I woke up Wednesday morning and Thursday morning and I actually wanted to do things. I wanted to live life." About 18 months ago, researchers at Yale found a possible explanation for ketamine's effectiveness. It seems to affect the glutamate system in a way that causes brain cells to form new connections. Researchers have long suspected that stress and depression weaken some connections among brain cells. Ketamine appears to reverse the process. But the drug has some serious drawbacks, Zarate says. For example, it's given intravenously, and patients often report alarming side effects during the infusion, he says. These include out-of-body experiences, hallucinations and memory problems. Also, people can get hooked on ketamine, and habitual use has been linked to serious mental and physical health problems. So scientists have been checking out other drugs that also tweak the glutamate system. Recent research suggests a more complicated explanation. Serotonin drugs work by stimulating the birth of new neurons, which eventually form new connections in the brain. But creating new neurons takes time — a few weeks, at least — which is thought to explain the delay in responding to antidepressant medications. Ketamine, in contrast, activates a different chemical system in the brain — the glutamate system. Researcher Ron Duman at Yale thinks ketamine rapidly increases the communication among existing neurons by creating new connections. This is a quicker process than waiting for new neurons to form and accomplishes the same goal of enhancing brain circuit activity. One is a pill called riluzole, which seems to be less potent than ketamine. Christopher Stephens has been taking it ever since his ketamine treatment at NIH. It's been more than a year now, and his depression hasn't returned, he says. Another possibility is a drug called scopolamine, which is used to prevent seasickness. Maura Furey, another researcher at the National Institute of Mental Health, began studying scopolamine about the same time Zarate began looking into ketamine. And when the public heard about her work, Furey says, she started getting phone calls, including one from a depressed woman who had tried scopolamine by accident. "She had gone out on a boat with her sister and used a scopolamine patch and noticed that her symptoms had lifted," Furey says. Furey's research showed that scopolamine often does work, though not as quickly as ketamine. One of the people who has been helped by the seasickness drug is Helene Najar, who lives in Bethesda, Md., with her family, a dog, a cat and a parrot named Wilbur. Current drugs helped control her depression, but always came with side effects, Najar says. So about five years ago she signed up for an NIH trial run by Furey. The study would give her scopolamine once a week for three weeks. The first dose didn't seem to make a difference, Najar says. But after the second one, she began to feel a change. "By the third, I was like a new person," she says. Scientists are still trying to figure out precisely how scopolamine works against depression. But there's evidence that the glutamate system is involved. And Najar says the effect is unlike any other drug she has taken. "There's no doubt in my mind [that] however it works or whatever receptors in the brain it works on, absolutely it has nailed exactly where my imbalance is," she says. The goal of the NIH experiments with ketamine, riluzole and scopolamine is to identify compounds that pharmaceutical companies can use as molecular models to develop an entirely new class of antidepressants, Furey says. "For people who actually design drugs, it would tell them chemically what they need to focus on," she says. Drug companies have taken notice. Several are now working on glutamate drugs for depression.